While flying in with WestJet to Vancouver in September, I noticed an advertisement for a "Fat Burger" chain in the airline's magazine. I made a mental note to find a location during our forthcoming adventures in Vancouver. 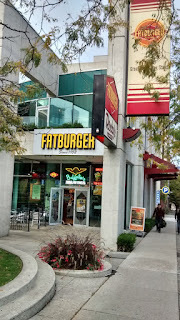 Later, on my way to Costco, I happened to find a Fatburger (111 Dunsmuir Street, Vancouver) at the corner of Beatty and Dunsmuir Streets. A few weeks later, I decided to stop by and see what the hubbub was about. I visited during lunch time to find a small restaurant with a patio outfront overlooking a some green space. Inside the restaurant had three large booth tables to choose from or perhaps a counter overlooking the window. Thank goodness it wasn't that busy as for sure there wouldn't be any seating left. My only downfall this visit, was arriving right after three university aged students who took their sweet time in ordering and asked at least ten different questions each. Of course this was not the fault of the lady of taking the orders. But with only one cash register, there was no alternative. Eventually, after what seemed to be an eternity, I was able to order. The Order: 1 Baby Fatburger (single paddy burger) with fries and soft drink. The employee printed my receipt, given my fountain drink cup and politely invited to have a seat for my order to freshly prepared. When the burger and fries were ready it was brought out to me. At $11.53 this meal rivaled in price to that of Five Guys Burgers & Fries, but would it in taste? There was only one way to find out. The hamburger itself was a delicious juicy burger. A little fatty tasting here and there, but a delicious juicy burger nonetheless. The toppings were satisfactory but not over the top fresh or special. 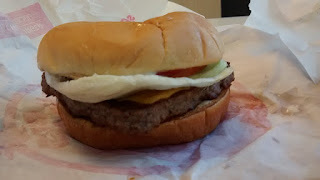 Just a solid made burger with a unique taste compared to the others in town offering similar. The fries were average cut fries. Sure they were nice and hot but nothing special in terms of preparation. Just straight cut fries with skin left on the tips like many other locales. 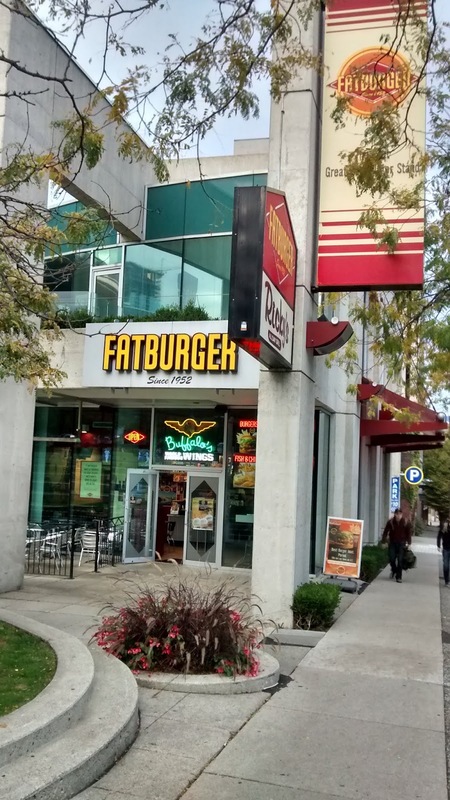 Overall, this Fatburger has issues during busy times with adequate number of space and an average menu. Looking for something unique? Go elsewhere. Looking for a solidly cooked burger and fries with nothing special? Fatburger is your place! I'd return in the future as the service is friendly and food prepared in a timely manner. But with ten or more people there? Forget it as there'd be no seats available! Wendy's Says "Hey, I'm Still Here!" One evening with my wife giving the evening off roam the streets of Vancouver all by myself, I ventured out. I wandered down Robson Street reviewing my dining options. Not feeling in the mood for much, I remembered that I had yet to find a Wendy's in my tips across Vancouver. With a few places offering Free Wifi, I found my way over to a Wendy's at 1150 Alberni Street. Paired with a Tim Hortons, this Wendy's is an anomaly in Downtown Vancouver, it is the only location still around! Even in Ottawa, Wendy's is pulling out of the core with it's only downtown location on Elgin street closing in the spring of 2015. It seems Wendy's is slowly giving up on it's downtown locations in favour of its more suburban locations with a few exceptions that stand out. Inside the Vancouver location, it looks like an average Wendy's that has yet to be renovated with the usual fast food style seating. Perhaps this is why this Wendy's is still here, this location is not due for a renovation as a requirement for it's continued operating under Wendy's licensing yet. I walked to the counter and ordered right away as there was no lineup. The Order: 1 Single Cheeseburger with a medium fries and a medium Coke. A short wait and my meal came together. I ventured over to the seating area where only a handful of customers of both Tim Hortons and Wendy's were found. With lots of choices to choose from, I settled into a table for one and unwrapped my burger. Like most fast food burgers, the first view of your food isn't that great. A traditional thrown together and serve it concoction instead of the more professional serve it on a plate pub style offering. But for less than $10 for a burger combo obviously the looks are what are sacrificed. Sure the Wendy's corporate requirements were met (e.g. one piece of lettuce, one tomato, etc.) and I have seen worse at other locales in terms of toppings. 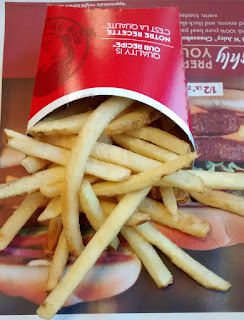 The small fries were average Wendy's offerings as well. Still warm, but just average offerings. Nothing to write about if you've been to a Wendy's before. Overall, this Wendy's continues the Dave Thomas tradition of serving up fast food tastes he pioneered. Service was decent at the counter with not a long wait. But with nobody in line, why should there be much of wait? Hopefully this restaurant will stick around downtown unlike quite a few of it's other incarnations. A familiar sight was found on Robson Street, that of Five Guys Burgers & Fries (635 Robson Street, Vancouver). My Mother-in-Law actually asked if we could visit Five Guys as no one else would go with her! Um...Sure! I arrived shortly after noon to for takeout. Surprisingly this downtown Five Guys Burgers & Fries has a decent amount of space with a full kitchen and customer seating area. Along with the traditional decor, is the usual friendly service and free peanuts to consume while you wait for your order. I waited two minutes while the customers in front of me ordered, paid and received their receipts to go and wait for their burgers to be prepared. The Order: 3 Little Hamburgers and 1 Large Fries. The cashier was impressed I knew exactly what I wanted. Well, considering I've ordered from Five Guys Burgers & Fries at the Ottawa Train Yards, I'd hope I would have my order down by now. I collected my receipt, some peanuts and a seat to wait for my order. With a steady steam of customers coming in, there was about a ten to fifteen minute wait. The funniest part of the wait was "order number 10" that was called out at least twenty times by the staff putting together the order. After about five minutes of off and on calling out the order number, this slicked haired overdressed customers waltz's in from the street and, after showing the receipt, picks up his order and walks out. Soon my order arrived at the counter and I picked it up, then headed for the doors. After arriving back at the nearby condominium, I unpacked our order from the usually grease stained paper bag. The fries, in their usually loosely packed nature in the bag, were plentiful and probably double the amount I get in Ottawa! 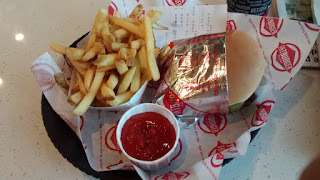 The hamburgers were the usual tastiness that Five Guys is known for. The only difference is the patties were little thicker than those found in my two visits to the Ottawa locations. The toppings were basically the same as well. Overall, the service was friendly and respectably fast in assembling the order. The food was in slightly better proportions than normal. If living in Vancouver, I'd be back! Of course while visiting Vancouver one does have to try out some of the more popular food locales. 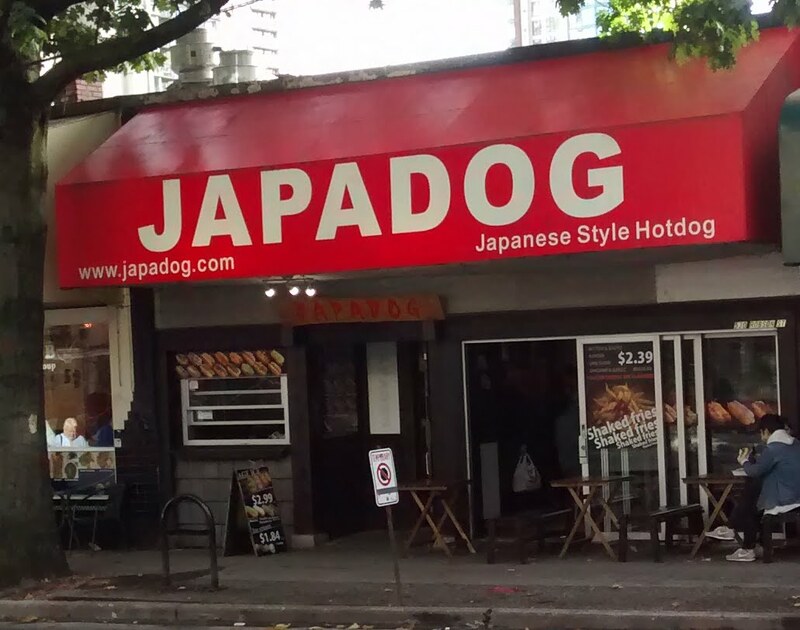 Over the past couple of years many have raved about Japadog and it's unique culinary take on the average hot dog. Japadog takes the average hot dog and tops it with various unique toppings like meat, seaweed and other gourmet toppings. Starting out with a single hot dog cart, this restaurant chain has grown into several more carts and a storefront location in the Vancouver area plus a couple of carts in California. Japadog has been noticed by many food blogs and tourist guidebooks since it's first cart that routinely had long line ups. Hence, my interest in trying at least once an culinary sensation from this popular restaurant family. With a Japadog storefront nearby at 530 Robson Street, it wasn't to hard to find my candidate location. I visited on a weeknight for dinner figuring it would be less lined up than on a lost tourist infused weekend crowd. I was correct in my assumption and only found a relative handful of people there. Being only second in line upon entering things moved fast especially considering the relatively cramped quarters of the restaurant compared to the more spacious Five Guys Burgers & Fries across the street. 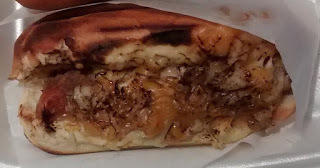 The Order: 1 Love Meat Hot Dog (Japadog's home made meat sauce is fused together with melted cheese). After ordering and paying for the meal, customers are issued a receipt with an order number on it. Next customers wait for their orders to be prepared by the Japadog staff team. This can take anywhere from a five minutes up to, I imagine, on busy days twenty minutes. With a cramped kitchen area due to the small retail space, there are only so many staff members that can assemble orders. My order was easily assembled and picked up in less than ten minutes. I left for the nearby condominium to grab a drink and other assortment of sides. I could have ordered a side, but at $5.99 plus tax for my hot dog alone, it was a little steep. The Love Meat Hot Dog was o.k. the hot dog itself was an average street sausage you could easily find at the nearby Costco Food Court. The most interesting part was the meat toppings. Interesting taste similar to a chili dog. But perhaps the most impressive thing was before I was given the order, the Japadog staff member used a blow torch to melt the cheese sprinkled on top. Overall, was the hot dog worth $6.00 plus tax? Not really, but it was a good one time experience that I can say I did while in Vancouver. I wouldn't make this a regular trip as for the price of food for the amount received is a little lacking. But for novelty sake, it is worth a trip if you're playing tourist. On a tour of Downtown Vancouver and the 2010 Vancouver Olypmic Cauldron at Canada place with our stroller in tow, we tried to visit the Tim Hortons across from Canada Place. But we couldn't figure out how to get the stroller down the stairs to that restaurant or even the McDonald's next door. We even circled the building to the Cordova Street side only to find an escalator down and directions for Wheelchair access and presumably an elevator. But the directions of course were incomprehensible as it only listed a side of the building we had no clue on how to get to. With no map on the directional sign, we gave up and soldiered on. 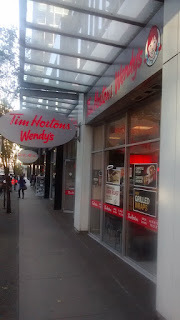 A few minutes later, on our trek up Seymour Street, was another Tim Hortons location within the Harbour Centre (555 West Hastings Street, Vancouver). This location has ground level entrance without any steps to traverse which is awesome for those of us pushing strollers exploring Vancouver's downtown. The only issue with this location is seating space. Sure the restaurant has a long street front presence but it is not very deep meaning there is only really counters in the window style seating. Not wanting to sit but wanting to continue on , I finagled the stroller inside the door. The cash was free so I was able to order right away while also not obstructing the restaurant too much. The Order: 1 Small Black Sumatran Coffee. In the Vancouver area Tim Hortons had released a "limited batch" Sumatran Coffee blend that was slightly more expensive than their "Original" or "Dark" roasts. To promote the new limited time blend offering Tim Hortons sent out coupons for a free small Sumatran blend at any participating Tim Hortons. While staying in a condominium in downtown Vancouver, these coupons quickly accumulated in the recycling bin near the condominium building's mailboxes. By the time less than a week had gone by, I had about forty of these coupons stockpiled! The employee quickly took my order, scanned the coupon and I was off with the stroller racing up the hill on Seymour Street. The Sumatran Coffee was hot and pretty tasty. A little richer than the regular Tim Hortons' Original blend. But really not worth the extra money for the average coffee drinker. Sure it's fine for a limited time to provide a special brew, but this one doesn't have the sticking power due to the price difference. The Sumatran blend is just not that special enough to be offered on an ongoing basis. Overall, this Tim Hortons location provides an easy to access spot for those in the Convention Centre and Olympic Cauldron area to grab a coffee. However, don't expect to stay for long as the seating is limited. This really is a tight Tim Hortons that is mainly great for a "grab and go" type visit. While working at the Vancouver Public Library's Central Branch, lunch was in order. With a variety of coffee shops, gift shops and small restaurants within the library's atrium, I decided to peruse my choices and see what I could find. 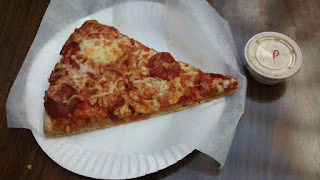 I settled on the Flying Wedge Pizza (345 Robson Street, Vancouver) which promised freshly made pizza along with a "wedge of the day" which provides discount pricing on type of slice per day. With plain old Pepperoni and Cheese being the "wedge of the day", I settled on that. Flying Wedge Pizza Co. Storefront. But where was the employee? All I could hear was running water in a sink off to the left behind the pop machine. I waited patiently about three minutes wondering if anyone noticed if I was there. Should I cough or stomp my feet to make my presence known? While I pondered this, a lady dressed in an a Flying Wedge Pizza apron emerged from behind the pop machine with a surprised look on her face like I had just been beamed down by Scottie. I welcomed her to Flying Wedge Pizza and asked if she would like to take my order. She smiled and listened. The Order: 1 Pepperoni Pizza Slice with Dr. Pepper. I paid for order, $5.60 and left to eat in the library's atrium where there is adequate restaurant style seating. I sat down to dig into the Pepperoni slice. The cheese was a little thin but the bready tasting crust was very evident. In fact, it tasted similar to a frozen pizza freshly warmed from the oven. As for freshness? Forget it, with barely enough cheese to cover the slice and average pepperoni the slice was a pass. Heck, I'd rather have a pay even more and walk across the street to Fantastico Pizza 2001. The pizza slice came with a Ranch Pesto Dipping Sauce as well. Good thing as after eating most of the slice, I wasn't in the mood to eat up a pizza crust without a little assistance for my taste buds. The dipping sauce was creamy yet with a little bit of slight spicy kick from the Pesto. Nice additional offering to set a pizza place apart by offering dipping sauce for the crust. Overall, Flying Wedge Pizza has a good story and idea behind it, make fresh tasting pizza with loads of toppings. Add on dipping sauce and the menu looks even better. Sadly, this location doesn't live up to that with bready tasting crust that tastes like it was fresh from oven but from a pizza box. For $5.60, for a discounted pizza slice I'd rather go elsewhere. 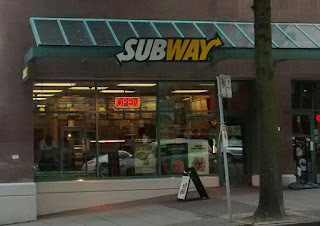 Looking for a quick evening bite to eat that wasn't a hamburger or pizza, I headed over to Subway (260 Robson Street, Vancouver). Upon entering, this location looks like any other modern upgraded Subway with a long counter to order at one end and present your cash at the other. In between is the usual sandwich counter where the culinary sandwiches are manufactured in an assembly line format. I reviewed the menu quickly to find most of the prices to be higher on each sandwich than in Ontario. I ordered anyway though wondering how all this would turn out once sales taxes were calculated and added to the Subway price. 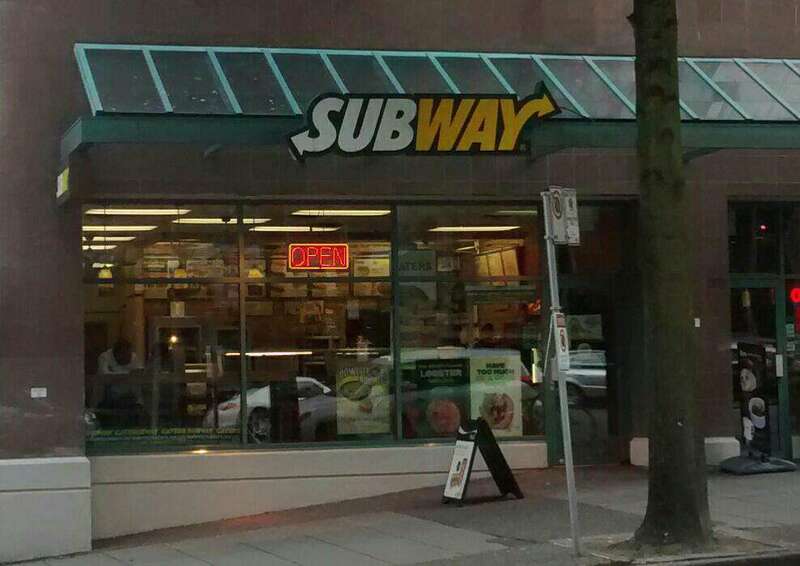 Subway Storefront on Robson Street. At $7.20, the Cold Cut Combo sandwich seemed almost the same price as the sandwich in the Ottawa area. The main difference in price is because the British Columbia provincial sales tax (PST) somehow didn't apply to this sandwich as it was not charged. The federal Goods and Services Tax (GST) was charged as per usual. So in reality, with Ontario's portion of the Harmonized Sales Tax being the difference, Subway has jacked up pricing by eight percent in BC instead of giving the savings to the customer. The sandwich was the usual Subway quality. However, another difference between Ontario and British Columbia Subway stores is they don't offer Swiss Cheese as an option in BC. Interestingly enough Subway charges more for a sandwich but provides fewer topping choices to it's BC customers. Overall, sure this was an average Subway location with average service. But corporate head office must review the pricing in the Vancouver area along with it's topping options. Perhaps the difference is in the tax structure and others between the two provinces. But after doing the math, an eight percent difference in price while carrying fewer sandwich toppings seems a little off.